NOW ... join ONE and share some food. Here's "Mr. I Got More Names than You." in action. "Please sign my petition to stop world hunger." JARS OF CLAY .... they're signing his HAT. Giles is doing a report on Theodore Roosevelt. And we've been researching the question: "how this president's spiritual life affected his term in office." Gee, that sure hasn't been mentioned in all of the picture books we got from the library. But we did find a copy of his speech given at the dedication of the house office building on April 15, 1906. "Materially we must strive to secure a broader economic opportunity for all men, so that each shall have a better chance to show the stuff of which he is made. Spiritually and ethically we must strive to bring about clean living and right thinking. We appreciate that the things of the body are important; but we appreciate also that the things of hte soul are immeasurably more important. The foundation-stone of national life is, and ever must be, the high individual character of the average citizen." That TR was such a muck-raking rough rider! If I could do one of those coffee table books ... that's what I would call it. "Waiting for the Bus." It would be of pictures of the people I see around our neighborhood sitting on the benches and congregating around the stops ... waiting for the buses to take them to work, home, school, the store. Think there's some good stories? That and a lot of wisdom. There's a cute older couple that I see a lot. She always has an umbrella to protect against the sun or the rain (or snow). There's another lady who rides with about three kids. 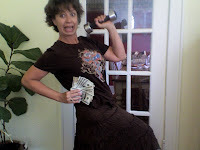 Another lady I know from Cross & Crown. She takes the bus to work and back every day. Yes, most people look poor. It's not so hip around here to ride the bus. But the riders are way hip. And they're savvy. They know this city, the schedules, the routes. And probably their driver's name. Fortunately, our city wants to expand our public transportation which might make it a more hip option in our greening consciousnesses ... and dwindling gasoline budgets. And I'm all for it. My dream is to commission a real photographer, like Joy's Tapestry Photographs, to shoot it. So, do we first find a publisher? How do you do that? 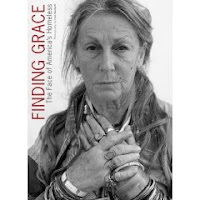 In the mean time, I found this book at the library, Finding Grace: The Face of America's Homeless. And I think I'll have to buy it for my coffee table. Amazing photography. And the best part about it is the text. Sparse and not on every picture. Certain portraits will have a paragraph ... a brief paragraph. But the story gets told. And many of those graphs bring a tear. 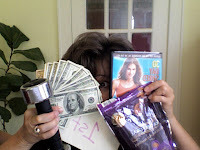 Haven't checked this blog lately but was humored to see this post on homeschooling! It's kind of like the skit on SNL the other night (the Tina Fey as Palin and Michael Phelps as host episode that, yes, we all stayed up to watch and then were grumpy at church the next morning). Humorous, but could have been WAY funnier. Thoughts? The comments on his homeschool post are interesting. Mostly, they make me sad. And I'm too chicken to say why. Kinda like I'm too chicken to get into a debate about Sarah Palin. I'm mostly for her, but my very very first thought about her before we knew anything more than her name was "I hope she's done raising her kids." Oh. Nope. And look at that new baby. See, I'm not "sexist." (whatever). Some of us are called to do MORE and can do more. This one is hard to share ... but here I go anyway. After our first 4-H meeting on a rainy Saturday morning, the fam stopped at a local German bakery. The kids, preferring chain food, were resistant, but the parents pressed on. Great place. Great food. We used to come here all of the time BEFORE WE HAD YOU. There will be a little band in there and a lot of seniors. So cute! And there will be a lot of plates with food that includes kraut, schnitzel and wurst. But there will also be fantastic bagels and other treats. Most all of the kids were pouty (even while munching on yummy bagels and cinnamon rolls) until the band started. And we began watching people dance. So cute! Then, Get Your Kicks on Route 66, started. And mom started swaying ... but only with her pointer fingers, thinking my only audience was at our own table. And we were all singing along. From out of nowhere, a gentleman approached our table and grabbed my hand TO DANCE. Oh. No. No. No. Please NO! I said. I don't dance. (I was raised in the Church of Christ). He, uh, did not take no for an answer. And by this time had my very own husband and children helping him get me out on the dance floor. I'll spare the rest of the clumsy details. However, I am certain the band played a few extra choruses just to carry on the mirth. Stan was in stitches. The children were afraid for me. "We don't know him." "Is mom ever coming back." The song was over. I bowed to my partner. And we were outa there. But should Stan be worried that I caught the eye of an octogenarian?